The World Breastfeeding Trends UK Report 2016 is now available. There are two parts: Part 1 has the main findings, Part 2 contains additional material. Printed copies of Part 1 are available for £15. Report cards summarising the WBTi assessment of programmes and practices are available for the UK, England, Northern Ireland, Scotland and Wales. It is important to realise that many healthcare professionals HAVE been trained in Breastfeeding Management and just because they cannot afford the cost of IBCLC, their training, experience and face to face contact is just as valuable as those holding a certificate. Also, volunteers may be volunteering as they lack the time to fill a full time psid role..it does not mean they lack quality training. Yes indeed! 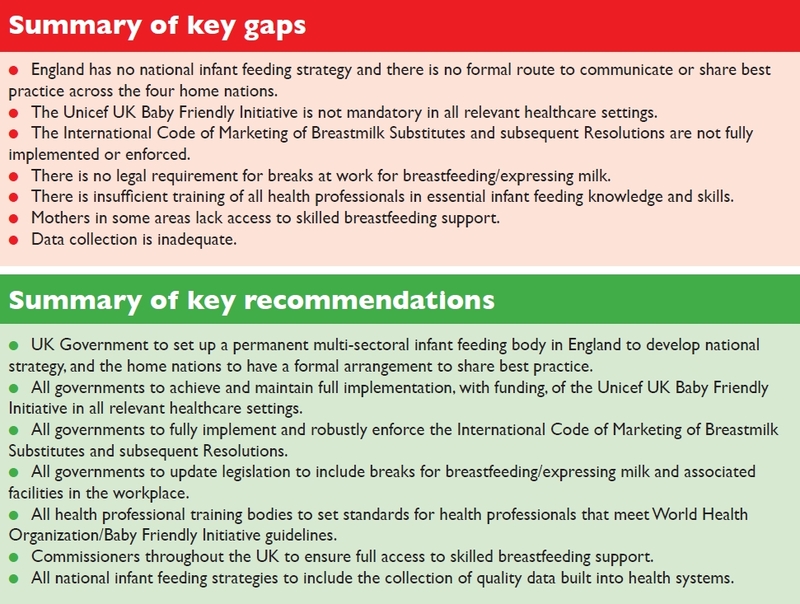 Our review (see Indicator 5) looks at the universal high level standards for training in infant feeding for various health professions who work with mothers and babies, in comparison to an Educational Checklist from WHO. There are indeed many individual health professionals who have training far beyond these minimum standards. And in Indicator 6 there is a closer look at breastfeeding support in the community, including the important role of the voluntary organisations. Have a look in both Part 1 (the main report) and Part 2 (supplementary material, which has a great deal of further information about specific health profession training standards in Indicator 5 and about the work of the voluntary organisations in Indicator 6).